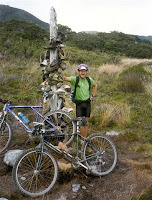 A few years back the announcement was made that the Heaphy track was going to be closed to bicycles. I had heard a lot about the ride so a buddy and I decided to that we would ride it before it became off limits for ever. We had a pretty busy long weekend planned that involved catching the Cook Strait ferry to Picton and a couple of hours driving to Takaka in Golden bay, where we would stay with my brother in law for the night and hit the track the next morning. The aim was to complete a there and back crossing in 2 days. I had a workmate who had run it in a day so figured it would be easily achievable on our mountainbikes. The weather going over on the ferry was pretty atrocious and it rained late into the night. Miraculously the next morning the weather had cleared and an early start had us on the trail at about 8am . Pretty soon we came across a couple who had been on the track the previous day during the bad weather. The track had turned into a river on them, and yet there was nothing to show for it. Obviously they were drenched, but there was no pooled water or degradation of the track to be seen. The conditions on the track were great and we only ocasionally came across people none of whom seemed to be to upset at sharing the track with a couple of cyclists. Sometime mid afternoon we came across some personal effects in the middle of the track. I cant recall what it was, a bank book or something, maybe a hut pass. Then low and behold, some more stuff. Maybe it was a wallet. its a while ago now so I cant remember exactly. Some time later we actually came across this guy, pushing a "10 - speed" style road bike on the track. Immediately my buddy Gary sized up the situation. 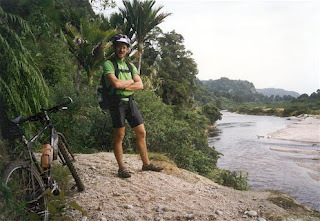 The guy's saddle bags were open and he was spilling his vaulables along the length of the Heaphy track. Armed with the knowledge we had gleaned from his personal belongings my buddy Gary launched into life! The guy turned around stunned that someone might recognise him in such a remote place. "Hey its me Gary! Remember I went to school with you!!" More blank looks from "Richard". Gary was having a great old time winding up Richard and eventually he let him in on the gag. It turned out that he was an american computer programmer who took his holidays in 2 month blocks and went travelling the world. Anyway. We were treated with some amazing views and a good supply of the west coasts most voracious predator, the ravenous sandfly. The next day we made the return trip and as we hit the car at the trails end, the heavens opened up. By the time we got to the Ferry the next morning, the township of Motueka had flooded behind us. 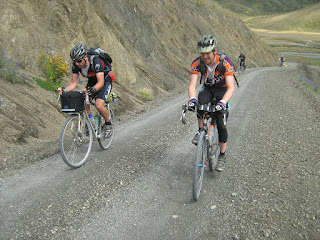 We had exactly 2 days worth of brilliant weather to ride one of the great rides, before it was made out of bounds.